The exclusive no deposit free bet offered by online bookmaker BetRally.com has expired. But we have brand new free bets with no deposit needed to give to all BetAndSkill readers! Don't miss the chance to start betting for free! We suggest you to visit LVBet, an UK-friendly bookmaker offering all BetAndSkill readers a £5 no deposit free bet! Alternatively, you can head to new Sportsbook BetZest (not accepting UK punters at the moment) for a $/€5 no deposit and no wagering free bet! 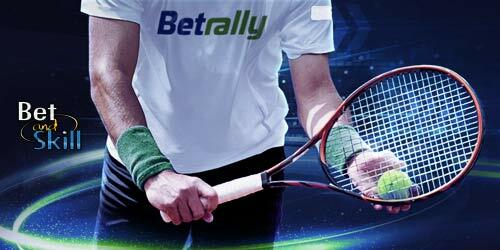 BetRally's free bet no deposit has been replaced by a €100 welcome bonus! 4. Simply bet your deposit amount and the bonus will be added to your account, eg. deposit €100 and you'll get a €100 bonus. Members are entitled to a welcome bonus of 100% up to €100 on their first deposit by entering code 100RALLY in the bonus code field. The bonus may be claimed either via the mobile site at m.betrally.com or via the Betrally.com desktop website. Members may claim only one welcome bonus. Members from Germany, Austria, Denmark, Finland, Sweden, Norway, Japan, Canada, Switzerland, Luxembourg, Iceland, Australia and New Zealand: deposit plus bonus amount must be rolled over 5 times on min. 3 selection combo bets of any type with odds of at least 1.50 per selection. Members from Greece, Czech Republic, Belarus, Russia, Serbia, Poland, Armenia, Georgia, Uzbekistan, China and the rest of the world: deposit plus bonus amount must be rolled over 10 times on min. 3 selection combo bets of any type with odds of at least 1.50 per selection. Withdrawals requested before the bonus rollover requirements completion will result in cancellation of the bonus as well as any generated winnings. Bonus must be rolled over within 90 days from claim or the bonus amount and any associated winnings will be cancelled. 50% of the bonus is the maximum amount that each bet will contribute to the rollover requirements. For example, for a €100 bonus, the maximum each bet can contribute towards the rollover requirements is €50. So a bet of €100 contributes €50. Multiple bets placed on the same event and selection will be seen as bonus manipulation. Bets placed on Draw No Bet and Forecast/Tricast do not count towards the bonus. "BetRally £/$/€5 no deposit free bet (Expired)"